Good day for all! I'm sorry about noob question, but after rats incursion i need to find missing parts. TIS didn't help. That is this part and connection from them? That's your Cruise Control Servo. That front connection goes over the top of the engine to the throttle control wheel. The back connection is a vacuum line which goes behind the engine to a "T" junction with other vacuum lines. The picture should answer your question. Picture is from the 2001 - 2003 Haynes Repair Manual. Last edited by CREWZIN; 02 Mar 2014 at 09:33 am. Before this a/c charge point question starts to go on and on as other posts about it have done in the past, let me say this, "it's impossable to do it wrong". The freon can has a hose that has a fitting on the end that will fit onto the correct side of the system ONLY. All factory a/c systems have two differant size fittings. 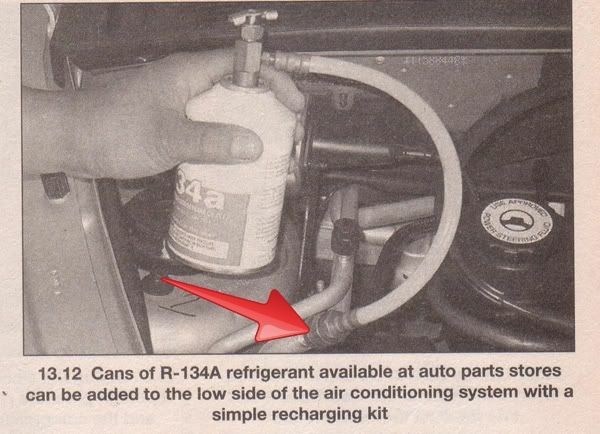 The aftermarket freon fill cannister will NOT connect to the wrong side of the system. You CAN NOT do it wrong. Last edited by wwpptc; 02 Mar 2014 at 06:02 pm. Thanks for answering my question Crewzin & wwpptc!!! Thanks, Randy! will check that one in Advance Auto.